Despite environmental clean-up efforts, plastics are still making their way into ocean water. Photo credit: shutterstock.com. The many different ways in which humans can affect the environment has been on close watch in recent years. One of the issues covered under the topic of environmental protection is the use and disposal of plastics. Plastic pollution has been an issue in various parts of the world for a long time now. While plastics are used in almost all spheres of today’s world from food packaging to shopping bags, their eventual disposal is causing more harm than good. People are concerned about the effects of plastics in the food industry as well as the impact on the environment. The concern for plastic pollution has extended to ocean and water bodies and the impact of these plastics on the aquatic ecosystems are finally being felt in the food web. A report published by The Guardian indicates that the rate of plastic waste in the United Kingdom stands at about 38.5 million plastics bottles per day. With such a high rate of waste generation, questions arise as to what the results are. Where are these wastes deposited and what are are their impacts? 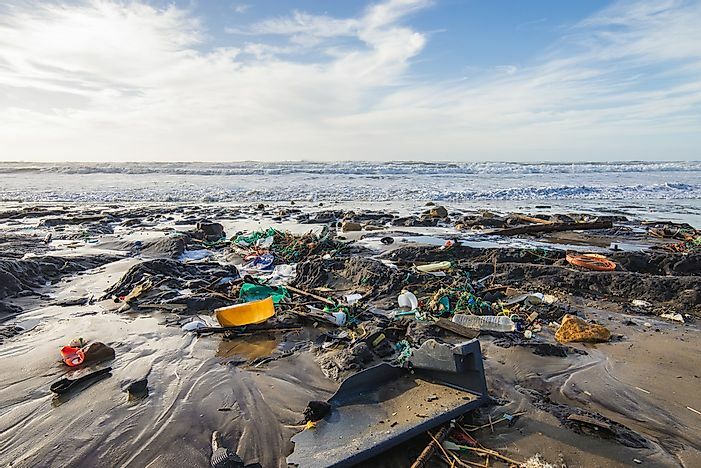 The report further indicates that most of the plastic waste finds its way into oceans and despite efforts of groups such as Surfers Against Sewage, the problem is likely to grow rather than fade out. The SAS group ranks the problem of plastic waste pollution alongside climate change. Other environmental campaigns encourage the rejection of plastic materials by consumers. Environmental groups are also concerned with the lack of initiative by soft drink manufacturers in the management of their plastic generation, use, and the impact on the environment. According to the report, even more alarming is the rate at which these plastics, especially smaller chips of plastics (microplastics) end up in the human body. The report indicates that these microplastics are trapped within the bodies of edible commercial fish. These plastics ultimately end up in human bodies. According to the post, about 11,000 microplastics end up in the bodies of European seafood consumers annually. The microplastics also accumulate in salt particles leading to consumption of these plastics indirectly through sea products. Apart from being trapped in the seafood and sea products, the microplastics may also be trapped in pollens ending up in honey. Other sources of microplastics ingestion include beer and milk. The report alerts that while consumers call for the removal of plastic food aisles in supermarkets, they should also be concerned with the plastic content in the foods they consume. Improved sea travel technology such as the introduction of electric ships may not be a solution to the problem of microplastics in seafood. This is because, while the ship itself is environment-friendly, the products carried by the ships (mostly chemicals and fertilizers), are not friendly to the environment.